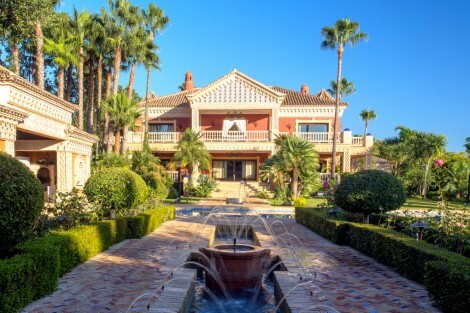 Exclusive classic Andalusian style villa located in La Quinta de Sierra Blanca, one of the most sought after residential areas of Marbella. This bright and immaculate home has been built to great detail by a renown Spanish architect using original pieces of marble and arches from monasteries and churches dating back to the 17th and 18th century. Built in 2012 in an Andalusian style, with Moroccan and Arabic influence and state-of-the-art craftsmanship. The impressive property is entered through a huge artisan archway of 5m height leading on to an extensive driveway surfaced with old marble pieces dating back to the Roman Empire. The imposing entrance hall with a height of 7m is topped by a cupola of huge dimensions and leads to a bright and extensive courtyard allowing light to enter the whole house. From here and from the entry hall you access the fully equipped, Clive Christian kitchen with granite tops, breakfast area and centre island. The living room, the lounge and dining room all lead to spacious covered porches, facing South and West and overlooking the sea. 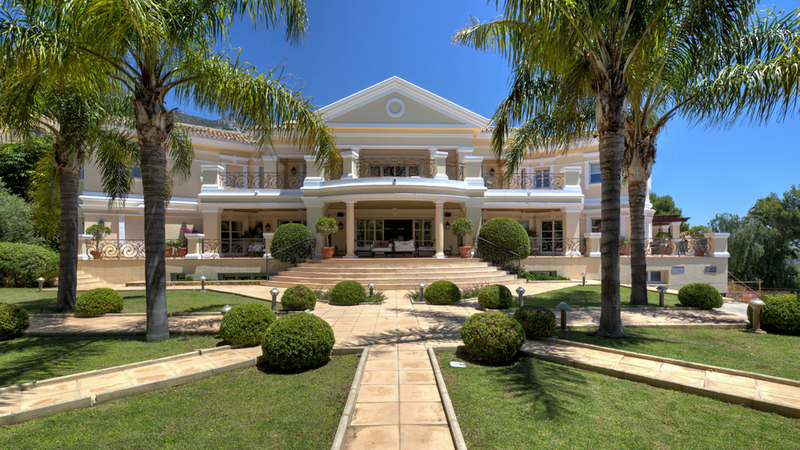 In the immaculate garden are the heated 20m pool and an imposing handcrafted gazebo with marble arches and columns. The upper floor is accessed by a wide, full grey marble staircase which again is topped by a cupola of brick laid artisan craftsmanship in Moroccan design. Upstairs are four large bedrooms en-suite and dressing rooms. All of the bedroom suites have individual terraces where either stunning sea views or a view towards the emblematic La Concha Mountain can be enjoyed. The basement of the house is distributed into a huge garage for 5 cars, an authentic wine cellar, separate apartment with 2 bedrooms for guests or staff, a cinema room, a sauna and the technical room with a heating system sourced efficiently by bio energy pallets. The property has a lift connecting all floors, central A/C hot and cold and under-floor heating throughout, piped music, marble and wooden floors, woodwork safety glazing and electric shutters with central locking. Price reduced from €14M. to €12.9M. Please, send me more information about ref W-0246YS, Villa in Sierra Blanca, Marbella Golden Mile or similar properties.